Welcome to Rhody Transportation and Warehousing! Transportation: Trucking (truckload and LCL/LTL); daily ocean container drayage to the ports of NY/NJ, Conley Terminal in Boston, and the Rail yards of Worcester MA and Mansfield MA; in bond transport; dedicated fleet service; same day service. 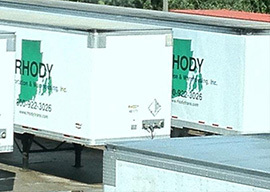 State of art, fuel efficient, leased fleet of 30 trucks; company owned and maintained chassis fleet. 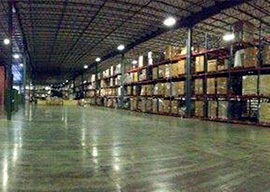 Warehousing: bonded warehousing services; temperature controlled; food grade facility; pick and pack; trans-loading; cross docking; order fulfillment. Trucking shuttle services. Rhody is strategically located along the northeast corridor between the commercial centers of New York/New Jersey and Boston. We specialize in moving ocean containers for import and export thru these port locations for loading / unloading throughout New England. We specialize in transporting and warehousing industrial and business products including machinery, non-perishable food and beverage cargo; paper, plastic, and non-hazardous chemicals. 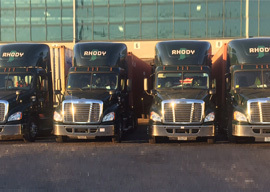 Whether you are importing raw materials for a manufacturing process or finished goods for re-sale, Rhody provides the expertise to manage your logistics and supply chain from the port, to your door. Our bonded warehouse offers a competitive alternative to storing or trans-loading your ocean cargo near the arrival port, which is often very expensive due to demand and proximity. We offer an "in bond" transport option to move your freight inland to our secure, food grade, temperature controlled warehouse, as an extension of your business. Rhody offers an array of additional services to our warehouse customers including order fulfillment; pick and pack; shipping via parcel, LTL, and TL carriers; product labeling, re-labeling, and repacking. 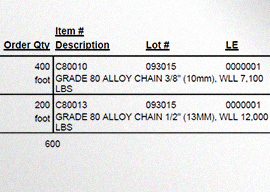 We offer secure online inventory management and computerized access for 24 hour inventory visibility. We also have the ability to marry our trucking services to our warehouse capabilities in order to offer time sensitive, daily shuttle services to feed manufacturing operations. Trucking (both truckload and LTL); ocean container drayage; air freight; LCL; in bond transport; same day, time critical, custom critical response; dedicated fleet and flatbed. Bonded warehouse service; climate control, food grade warehouse; pick and pack; trans-load; cross-dock and order fulfillment.